Beaded Couture features small white and transparent crystals and slightly larger, oval gold-rimmed crystals arranged on a clear base. I turned down the highlights in this photo in hopes that it's easier to see the design. 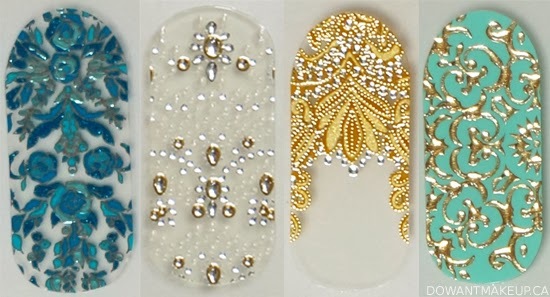 This set totally reads "BRIDAL" for me: the design reminds me of tiaras and would look gorgeous but not-too-out-there on top of a polish that is close to your own skin tone. Alternately, I would love to try this on a rich, navy blue to really let those crystals shine. Silk Rosette has dark teal and turquoise roses and leaves delicately outlined in bronze on a clear base. The darkest teal shade has a hint of sparkle. Naturally, this is one of my favourite designs for the colour, but also the really intricate pattern. 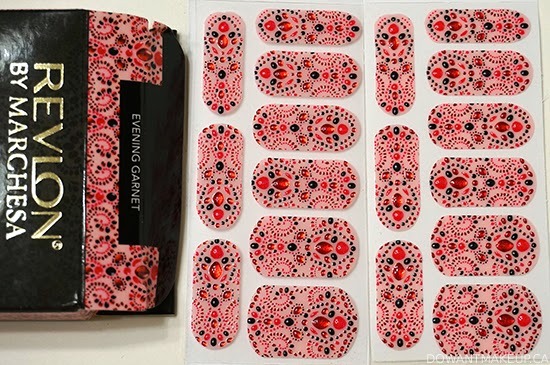 Evening Garnet (swatches here) has red, red-pink, and black jewels on a fleshy pink base. These are the most "3D" of the collection, because of the relatively large red and red-pink jewels. Even the very small red and black dots are raised. 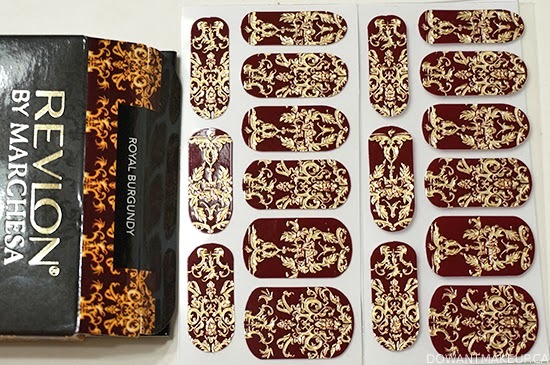 Royal Burgundy has a gold filigree pattern on top of a rich burgundy base (the first photo of Royal Burgundy near the beginning of the post is more colour-accurate, by the way.) Although it's a little hard to tell, the gold filigree is raised in places, which adds extra dimension and catches the light. 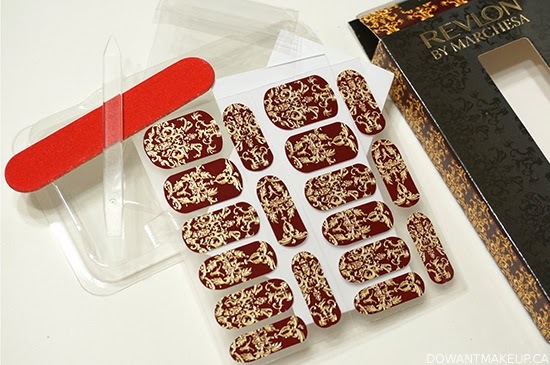 Apply these while watching some historical fiction like The Tudors and feel extra regal. Jeweled Noir features gold and red crystals on a pitch-black base, accented with painted-on silver "beading". Something about this set is really mesmerizing and reminds me of an ornate headdress or veil of jewels worn by somebody with black hair. 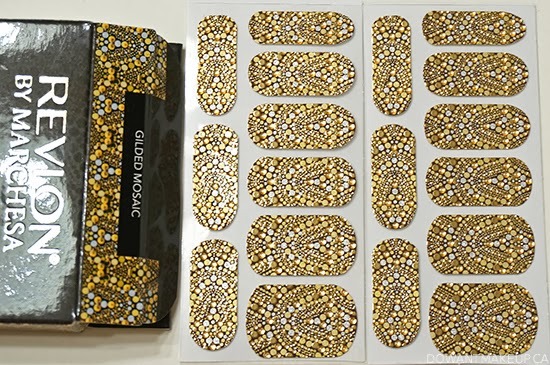 Gilded Mosaic has painted-on metallic silver and gold dots accented by gold crystals on a black base. This is definitely the most ornate and flashy design of the collection. It kind of reminds me of Gustav Klimt paintings with all the gold or alternately, a gold- and silver-cobbled pathway leading up to a grand cathedral. 24K Brocade is a an embossed gold filigree design on a turquoise base. If you know me, you probably took one look at this and knew I saved my favourite for last. I just can't resist the bright turquoise colour, like a lighter China Glaze For Audrey. Actually, if someone could find me a perfect colour match in a nail polish, I'd love him/her forever. While the filigree in Royal Burgundy brought to mind Western European tapestries and family crests, the filigree in this one is more delicate and airy. The plastic sheets holding the strips are flexible, so you can sort of bend the one you like around your nail to get an idea of which size fits before you peel it off. Each strip has two curving ends, but they are distinctly different. For most people, the end that curves more steeply should go against your cuticle. If you apply the applique too close to your cuticle and they overlap slightly, you can use the included cuticle stick to gently push back your cuticles to make extra room for the applique. I always push back my cuticles before applying any nail polish, but was able to push a little more to make an overlapping strip fit. 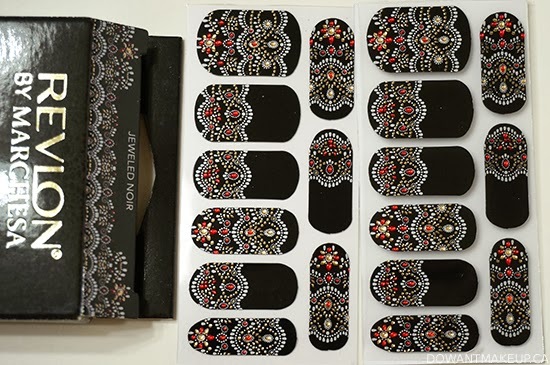 Press the applique down the middle of your nail length-wise first, then use the cuticle stick or your finger to smooth the sides from the middle outwards, and then press all around the edges so it adheres well. Unlike the instructions on the box say, do not file sideways (left to right). I felt like this caused a raggedy edge on my strips. I had much more success filing in a topside-down motion, which I think helps the free edge of the strip grab on to the underside of your nail. 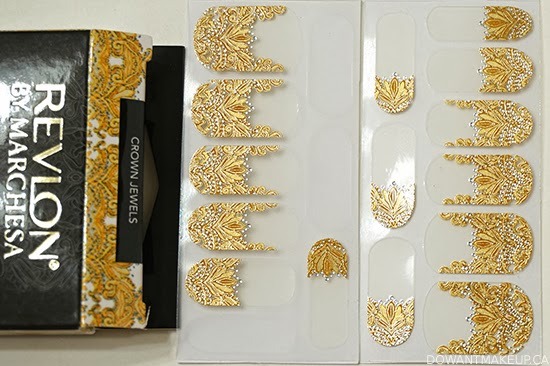 I used the included nail file to cut off the excess nail strip first because it's coarse enough to saw through the thicker elements of some of the appliques, like the jewels. For smoothing down the remaining free edge, I preferred using a fine 400 grit nail file. If your fingernails are small/short enough, you may be able to get two uses out of one strip. I recommend cutting the strip in half while it is still adhered to the plastic sheet to avoid potential wrinkling. 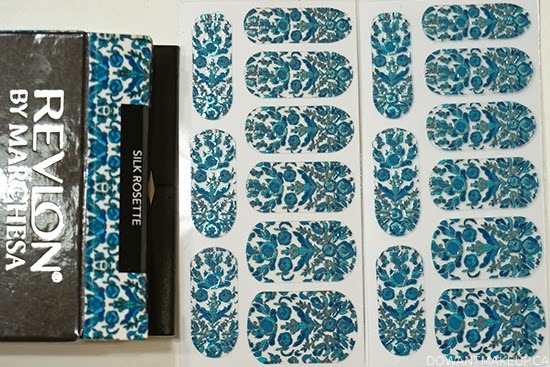 Try stretching the life of your set by wearing only one or two at a time as accent nails. The box says you also get a buffer in the box, but I didn't see one in any of my boxes. I'm hoping Revlon wasn't referring to the one nail file with different levels of grit on each side, in which case do not use that as a nail buffer unless you are Thing from Fantastic Four. Both sides are way too coarse for nail buffing. 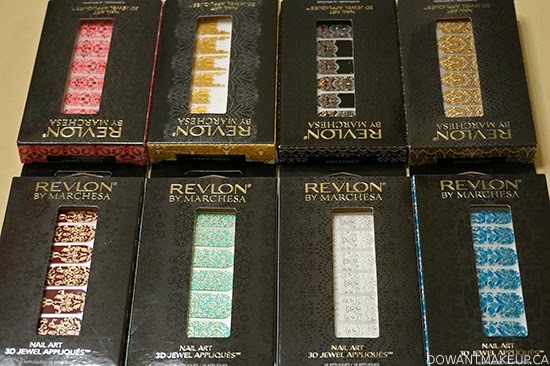 Since the Revlon by Marchesa sets were my very first nail strips, I can't say whether they last or apply better/worse than other nail strips out there. I thought they were really quick and easy to use, and I was amazed that during removal, each one peeled off so easily in one whole piece. 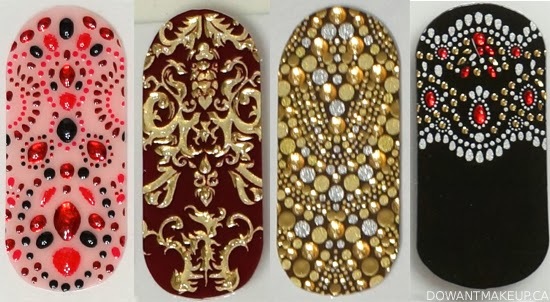 I did find that the ones I tried (Evening Garnet, Crown Jewels) chipped/wore away rather quickly even with top coat (within 1-2 days) compared to conventional nail polish, but I'm not sure if that's just how nail strips are. Another thing I'm not too sure about is whether applying base coat or top coat is a help/hindrance, so I'd love to hear your thoughts on that as well. 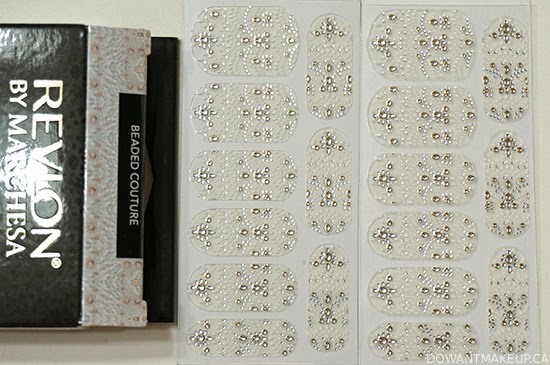 Overall, I think ~$8.95 CAD is a pretty great price for nail strips that are so unique and incredibly detailed. They're so beautiful that they're kinda like collectors' items to me. Hopefully Revlon comes up with more amazing collaborations so my little hoard can grow! I don't have any plans to swatch the other strips right now, so I hope my photos were helpful. I love you all, but it seems like a terrible waste to apply these gorgeous, limited edition, short-lived strips on my nails and then just hang out and play Borderlands 2 in my sweatpants, you know? Personally, I'd rather save them for a special occasion. Thanks for reading this long, long post! Which designs are your favourites?